The curious case of Mick Ronson is a great example of why I like doing this series so much. Rock fans can be a sentimental lot and Ronson, who came to prominence as David Bowie’s right-hand man in the heady days of Ziggy Stardust, is still greatly admired long after his untimely death in 1993 at age 46. A classically-trained musician from the craggy port city of Hull, England, Ronson did not find much success in London with his late 60s rock outfit called The Rats. He eventually left the capital, not knowing he had recently attracted the attention of Bowie. Although he had had a hit with “Space Oddity” (considered a bit of a novelty record at the time), Bowie harbored plans to achieve pop immortality via some transformative concept. As the story goes, one of Mick’s ex-drummers found the guitarist back up in Hull, marking out the end lines on a rugby field, part of his job in the city’s parks dept. 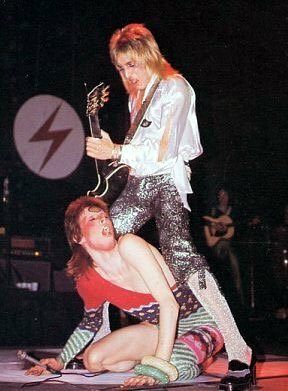 Convinced to give London another try, Ronson got the gig as Bowie’s guitarist on the two albums (The Man Who Sold the World and Hunky Dory) leading up to the world-beating The Rise and Fall of Ziggy Stardust and the Spiders from Mars. By the time of Bowie’s alter-ego masterstroke, Ronson was more than just the flashy lead guitarist in the singer’s gender-bender, sci-fi alternate universe. Ronno, as he was now known, was a principal player in the album’s cinematic sweep, as arranger and keyboardist in addition to his incandescent guitar work—not to mention his role as Bowie’s onstage foil when the Ziggy show went on the road. Obliged to dress in the glittery style of the leader, as did drummer Woody Woodmansey and bassist Trevor Bolder, those were special times for Ronson as the top Spider. But as revolutionary as the look and sound was, pointing the way to both the punk era and the image-conscious 80s pop, Bowie was not a guy to stay in one bag for very long. Though Ronson was still an integral part of the Ziggy follow-up Aladdin Sane and the covers album Pinups, he was soon out of the silver suit and would only play with David on a couple of occasions after that. 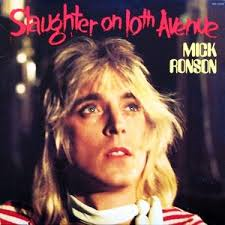 His first solo LP, Slaughter on Tenth Avenue, arrived soon after in Feb. of 1974 and made #9 on the UK charts. This is an album that still gets a lot of love, sometimes to a strange degree. On the extreme fringe, one online true believer, states that Tenth Avenue is the greatest rock music ever produced, with the exception of Jimi Hendrix. Really, even better than Ziggy Stardust? This is obviously the work of a very talented musician but it also gives every indication of being a toe-dipper in the solo-artist waters. Mick makes a very debatable decision opening the record with a version of “Love Me Tender.” Starting off with a soft-serve Elvis cover does not exactly indicate a forward charge up to the rock ‘n’ roll Acropolis. Elsewhere, there are three tunes that David Bowie had a hand in writing, all well sung and played by Ronson in the moonage-daydream style of recent vintage. (The best of the three, “Growing Up and I’m Fine,” is heard above). Most intriguing is the title cut as Ronno delivers a sterling rockist rendition of a Richard Rogers dance piece he loved since the days of his youthful music lessons—the cabaret-style piano and the long line of dramatic sustained guitar notes does justify the hype of the man’s eager-beaver followers. Like a lot of the folks featured in the series, Ronson found his greatest market value in a support role or behind the scenes. In between this album and his solo follow-up (Play Don’t Worry, #29 UK) he was in the final line-up of Mott the Hoople. Ronson would go on to form a partnership with Mott frontman Ian Hunter that would last for several albums and tours. Later he would appear with Bob Dylan’s Rolling Thunder Revue while producing and/or playing on records from a diverse list of artists that included Lou Reed, Van Morrison, Ellen Foley, the Rich Kids, T-Bone Burnett, Morrissey and even David Cassidy. In 1992, shortly after being diagnosed with cancer, he appeared at the Freddie Mercury Tribute Concert where he was re-united with both Bowie and Hunter. Despite never being as famous as those he helped support (or partly because of it), the secondary spotlight shining on Ronson still burns plenty bright. Today, “Top of the Pops,” Tomorrow the World! ← “Help!” at 50: The Birth of Pop Modernism or Middling James Bond Spoof? Why Not Both? So true about the Ronno myth. He was a great Bowie sideman and key to that early-70s Bowie sound, but I prefer to call Robert Fripp the most brilliant guitar collaborator with Bowie.